Since the early nineties, La Barra's centre has became one of the hottest spots of Punta del Este's nightlife. 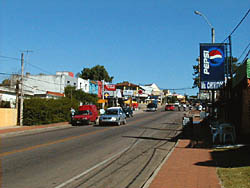 Originally, La Barra grew due to the influx of people who chose the area because of its peace and quiet. Nowadays, it has become a reference point for fads and fashions, and it is a live "who is who". In a few blocks are crowded the most popular bars, pubs, clothes stores, together with well-known restaurants and art galleries. It is the compulsory meeting point for young people, generally between one and three a.m., before dancing. Another popular point is immediately after crossing the bridge. On both sides of the road there are pubs and discos, where mostly teenagers hang out.